Stop me if you think you’ve heard this one before: A coolly handsome, accomplished professional secretly goes on a jealousy-fueled killing spree. A nosy detective and a pesky secretary find their way into the mix. References to specific bands of the era and three-way sexual escapades abound. Yes, “Kill Your Friends” inevitably invites comparisons to “American Psycho,” both in its themes and content, and it doesn’t measure up favorably. It’s amusingly slick and mean for a while, but ultimately the film’s one-note nihilism grows numbing, and its stylish visuals and well-chosen soundtrack can only do so much to keep it lively. But director Owen Harris shows some real flashes of verve with his first feature, based on John Niven’s novel of the same name about an A&R executive working at a London-based record label when ‘90s Britpop bands like Blur, Oasis and Radiohead ruled. Niven, a veteran A&R man himself, also adapted the screenplay, and I wonder whether some of his crueler lines played better on the page than they do in star Nicholas Hoult’s copious voiceover. Harris’ pacing is snappy and he’s created a vivid sense of place, full of stark, gleaming interiors and lurid, neon-lit dance clubs. You just wouldn’t want to spend a lot of time in any of these places or with any of these characters. Hoult is well-cast, though, as the self-serving and soulless Steven Stelfox, who doesn’t actually care about signing bands that are worthwhile or even good. He only cares about making money. With his steely blue eyes, sharp cheekbones and sinewy frame, he’s a merciless animal on the prowl. Sleekly, expensively dressed, he’s beautiful but dangerous, but his repeated fourth-wall breaking becomes more annoying than menacing. When we first meet Stelfox, it’s 4 a.m. and he’s doing insane amounts of cocaine with his slovenly co-worker, Waters (James Corden), who might become his boss. Waters also will become Stelfox’s first unfortunate victim and make him the target of a police investigation. In this cynical world, though, the detective assigned to the case (Edward Hogg) is an aspiring musician who slips Stelfox a demo CD after asking him a few softball questions about where he was on that fateful night. 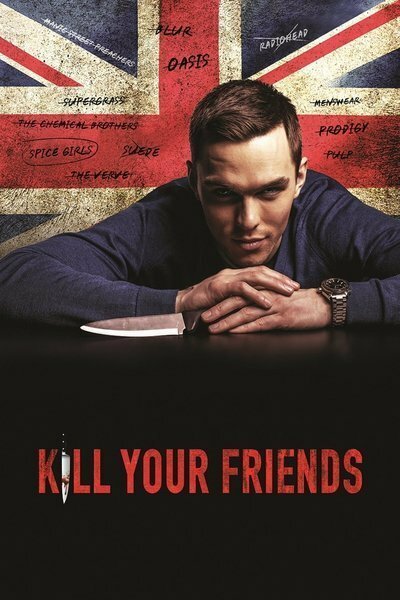 That’s the thing about “Kill Your Friends”: It has mood and dark laughs to spare, but no real surprises. Everyone is horrible all the time—so when they do horrible things to each other, the result is a chuckle rather than a vicious bite. The music business is cutthroat, we get it. And the acts themselves that Stelfox must juggle while trying to hide his homicidal tendencies are a hoot—a very knowing cross-section of the kinds of music that were popular about 20 years ago. There’s a self-important, Swedish indie band called The Lazies; a self-destructive, experimental rapper named Rage (Osy Ikhile); a misogynistic German DJ (Moritz Bleibtreu) whose biggest hit has a title that’s so vile, we can’t even hint at it here; and a half-baked Spice Girls rip-off called The Songbirds consisting of four girls who can’t sing or dance. In case we didn’t know from the film’s overpoweringly cynical tone that the music industry is shallow and soul-sucking, these groups make that point ring out loud and clear.